Don’t you know that you can follow the Samsung Galaxy Note 5 Battery saving tips that will benefit you? One that you will get by following the tips and tricks is that you will have the powerful battery. You must know that the main problem of the battery is draining faster. It is so frustrating if you need life longer battery to support your need. But now, you don’t need to worry since Samsung has provided the battery saver especially for Samsung Galaxy Note 5. This phablet will benefit you through the battery stuff only if you can manage it. The effort to make the battery life longer will also affect the battery quality. The quality will be living longer than expected before. To do it, you can follow the explanation below. There are also some suggestions or tips to support and maximize your battery power. Fortunately, you can now manage the battery saver mode through many ways. It is interesting because you can choose the right method that suit with your need. There are two options that you can select as saving mode. They are the regular mode and the ultra-mode. The latest one offers better performance with the particular condition. To enable the battery saving mode, go to your Setting menu. Go to your home screen or through the notification bar. If you use the notification bar, choose the symbol with the gear symbol. 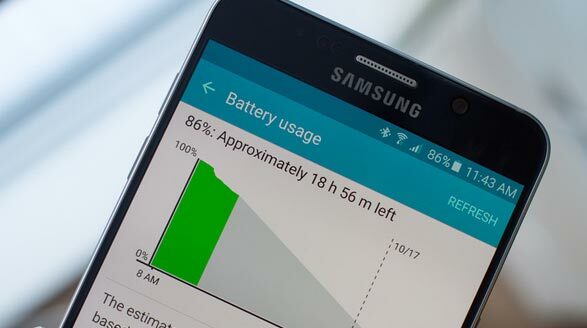 Start the Samsung Galaxy Note 5 Battery saving tips by tap the Battery menu. Choose Power saving mode by tapping it. Then, choose the way that suits you. And, you are done to make your battery life longer. To support your battery, you can do many things. It will also maximize the battery saving mode, so you get more time to use your phone. First, try to check to power usage, make sure you know which apps that drain your battery or use it too much. Check it through the same way above, but choose Battery usage options and review it. You can also select the Abnormal battery usage options to see the apps that consume the battery much. Try to manage the apps that take power much. Other things you can do is to avoid the live wallpaper, vibration and use it as you need only. Follow these Samsung Galaxy Note 5 Battery saving tips that will benefit you much so your phone lives longer.